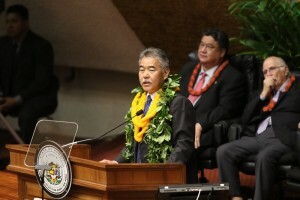 Governor David Ige delivered his fourth State of the State Address today and touched on key areas including the high cost of living, homelessness, and unemployment. Gov. Ige did not speak about the false ballistic missile alert that went out to people in Hawaiʻi on Saturday, Jan. 13, 2018. Gov. Ige touched on his successes as being Hawaiʻi’s governor and what improvements still need to be made. Homelessness is down 9% statewide – the first decline in eight years. Below is a text of the Governor’s address with highlights of each topic that was brought up. “We have the lowest unemployment rate in the nation. We are strong financially. Our bond rating is the highest it’s ever been in our history, making it possible for us to get the most bang for our buck when we borrow money. This saves the state tens of millions of dollars, allowing us to make critical investments in our schools, housing and highways. Even though tourism is up and unemployment is low, many of our residents are living paycheck to paycheck, one health emergency or car repair away from a crisis. Some people may have two or three jobs to make ends meet. The challenge is not just creating jobs, it’s about creating quality jobs and the training to go with them. I’m working to transform our economy to give residents a diversity of employment opportunities that pay higher wages and lead to a better quality of life. ʻOhana also means that you should be able to put food on the table and be home with your family to eat it. That means jobs that pay well and commutes that work. 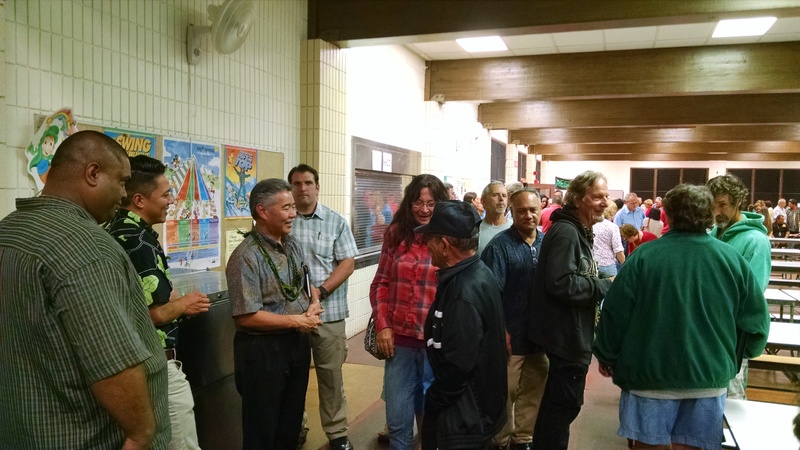 Governor David Ige meets with community members at Thursday’s community lava meeting, held at the Pahoa High School cafeteria. Photo credit: Christopher Yoakum. “I also promised to empower our schools so they can focus on 21st century skills and critical learning. In meetings around the state, community members, teachers, staff and principals expressed frustration about top-down mandates and a one-size-fits-all approach to schools. And so, with more than 3,000 parents, teachers and community members from around the state, we created a new Blueprint for Education. This blueprint for change is now in the hands of new DOE leadership. I also recognized that it is not enough just to say to our teachers, “We respect how hard you work.” That’s why, we have given our educators the pay raises they have long deserved. My grandparents came to Hawaiʻi in search of opportunities. It is not acceptable to me that many of our kids are essentially becoming immigrants in other places because we don’t have the opportunities here. While there is more to do, I am proud of what we have accomplished. We have more Early College programs so high school students can earn college credits, saving families money and making it easier to graduate with degrees. We expanded campuses and offer more courses at UH West Oʻahu and Palamanui. The creation of Hawai‘i’s Promise scholarships helps to pay for the costs of attending UH community colleges. The Entrepreneur’s Sandbox in Kaka‘ako brings start-ups together in one shared space and helps with loans and grants. We also founded the annual “hackathon” competition, which enlists hundreds of professional and amateur code writers to develop solutions for the state’s biggest information technology challenges. We must prepare our young people for jobs in this sector and that means supporting STEM education, focusing on science, technology, engineering and math. The good news is that it is expanding at all levels. The University of Hawaiʻi is one of the leaders in this work, with the Mānoa campus increasing its STEM graduates by more than a third in recent years and the community colleges tripling theirs. Also helping to train students in our schools are partners like DevLeague, a computer programming and coding academy, founded by two local software engineers. They are working with the DOE and private foundations. Together, they are teaching high school students advanced coding and cyber security. We’d like to recognize DevLeague’s founders, Jason Sewell and Russel Cheng. To be sure that workers in Hawai‘i’s existing industries aren’t left behind, we’ve made available a wide variety of vocational training opportunities through the Department of Labor and Industrial Relations. These programs match training with current job openings in fields ranging from computer science and shipyard welding to banking and food safety. And within state government, as we ride the wave of modernization, we remain fully committed to retraining every worker to use the new computer systems and technology tools. Technology helps us be more responsive to the public we serve. For those who want to live in Hawai‘i, probably no issue is more challenging than finding a decent, affordable place to live. And probably no issue challenges us as a society more than the daily sight of those who are now living on our streets and in our parks. We have dedicated more money to mental health treatment and services, including to our homeless population. We have initiated the largest annual increase in production of affordable housing with thousands of new units. We’re on track to meet our goal of 10,000 new housing units by 2020, with at least 40% affordable. I’m requesting $100 million to maintain the momentum and produce more affordable homes across the state. Our “Housing First” policy focuses on transitional housing as a way to get people into permanent housing. The New Kaka‘ako Family Assessment Center moves families off the streets and into permanent housing in less than 90 days. A “special team” in public housing reduced the vacant unit turnaround time from 267 days to just seven days. And our landlord summits increased the number of landlords willing to rent to families transitioning out of homelessness. Even in the tragedy that is homelessness, there are significant signs that these policies are starting to work. Homelessness is down 9% statewide – the first decline in eight years. There’s more to be done for sure. We continue our efforts to offer services to those who have so far refused to leave the streets. We have set aside monies in this year’s budget to support more progress on the homelessness front. Our budget request also includes $15 million in additional funding for Housing First initiatives, outreach services and maintaining safety in public places. We also know how important community partners have been in tackling this challenge. Take Kahauiki Village, a permanent housing project for homeless families launched by local businessman and philanthropist Duane Kurisu. Duane brought together city, state, nonprofits and businesses to make the village a reality in record time. The first 30 families recently moved in. It has been my firm belief that the state must remain committed to developing and delivering Hawaiian homelands to beneficiaries. In 2016, we provided $24 million in funding to the Department of Hawaiian Home Lands. This was the highest level of funding in the department’s 95-year history and more than double what had been set aside previously. For its part, Hawaiian Home Lands has been ramping up development of vacant and turn-key lots. More than 220 lots were awarded in 2017 and that number will more than double in 2018. We’ve also worked hard with the department to spend down federal funds and identify alternative sources of revenue that can be used to sustain the agency over time. I have three goals: get projects done quickly, get them done inexpensively, and get them done with minimal impact to the environment. From zipper, shoulder lanes and other contraflow lanes, to safety around our public schools and truck-only routes, we are going to where the problems are. We’re reducing back-ups and bottlenecks – in West and Windward Oʻahu, Kahului, Lahaina, Līhuʻe, Hilo, Kona and other communities across the state. “We are one of the healthiest states in the nation. People here live longer than anywhere else in the country. We have led the nation in health insurance for decades, and in the current chaos, we stand firm in caring for each other. Pacific Biodiesel’s Director of Operations Jenna Long and Agricultural Program Manager James Twigg-Smith explain to Governor Ige how the crushing mill, located on the lot adjacent to the refinery, fits into the Company’s sustainability model. Pacific Biodiesel photo. We’re also making great strides in protecting our ʻāina and ocean resources. To date, we have protected over 40,000 acres of watershed forests on Kauaʻi, Oʻahu, Molokaʻi and Hawaiʻi islands. We helped preserve and protect Turtle Bay lands from development. A joint agreement with the US Navy is helping us reach our renewable energy goals. And together, we’ve established guidelines to use recycled water on food crops. Working with all of you here in the Legislature, we were able to provide tax credits for organic farmers, which means a healthier people and healthier lands. You passed and I signed a law to abide by the Paris Climate Accord – the first state in the nation to do so. We understand deeply and fully what the future requires of us. I also fought to give Native Hawaiians a seat at the table when it comes to the management of Papahānaumokuakea National Marine Monument. The Office of Hawaiian Affairs is now a co- trustee of the monument. Our goal of increasing local food production is another golden opportunity for Hawaiʻi. We are blessed with four growing seasons and a land-grant university with a College of Tropical Agriculture that has a long history of cutting-edge work. With all these factors, Hawaiʻi can and must become the premier center for new agricultural technologies. We already have ag tech startups going strong in Hawai‘i. One company that comes to mind is Smart Yields. They help small and medium farmers to increase their production with data analytics and other tools. The company received international attention when it was chosen to be a part of the Vatican’s first tech accelerator focused on global food production. At this time, I’d like to recognize Smart Yields CEO Vincent Kimura and his mentor, Hawai‘i Island farmer Richard Ha. What we now need is the driver to make greater local food production possible. There is no better way than through our schools. I applaud the new leadership in the DOE’s Farm to School program, the leadership provided by Lt. 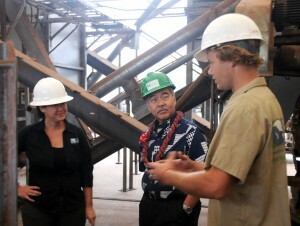 Governor Shan Tsutsui, and the great cooperation of the Department of Agriculture and the State’s Procurement Office. Clean energy is not only critical to air and water quality, it is important to our economy and our wallets as we work to reduce our reliance on fossil fuels imported from the mainland. Working with the Legislature, I was the first governor to sign into law a bill requiring 100% of Hawai‘i’s electricity to come from renewable sources by 2045. Again, this demonstrates what we can accomplish when we work together. We want hydropower, sea water air conditioning, solar and wind energy, biomass and the fullest possible use of our waste streams. We celebrate the Hu Honua Power Plant on the Big Island as well as the new solar farms on other islands. And this week we will join NRG Energy, Hawaiian Electric and Kamehameha Schools in celebrating three utility-scale solar projects on Oʻahu. As a next step, we will grow a carbon market in Hawaiʻi. This way carbon polluters around the world can invest in restoring Hawaiʻi’s koa and ʻōhiʻa trees to offset their carbon emissions. We want the brainpower and the imagination of the world to continue to come here. They can help us find our way to 100% renewable energy sources for electricity, and in doing so, help the world find its way to 100%. Let us take the billions we export for fossil fuels, spend it here, and then export the energy systems we develop. We are dreaming big and creating the promise of limitless opportunities. Anything less means we are letting down the next generation. 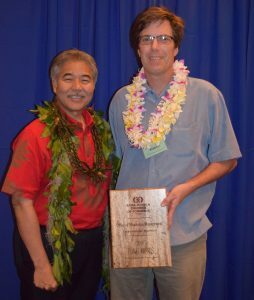 The Office of Mauna Kea Management (OMKM) is this year’s recipient of the Kona-Kohala Chamber of Commerce Pualu Award for Environmental Awareness. Hawai‘i has so much potential in this new globally connected world. We are already viewed as the ideal research base and testing ground for innovative, globally significant technologies such as telemedicine, smart cities, driverless vehicles and aquaculture. Hawai‘i is a leader in solving the issues of our time. Much of what we do here in Hawai‘i is ground-breaking. Hawai‘i is home to many talented individuals breaking new ground every day. Hawai‘i is full of stories of business innovators blazing the trail to create new products and services. The Big Island’s Tina Fitch turned her start-up Switchfly into a global software platform used by almost every major travel and hospitality company. Now, she’s returned home and started a second company, HobNob. I’d like to recognize Tina, who flew in to be with us this morning. In our own state government, employees are helping us improve our services to the public every day. One example is a team of young millennials known as “The Three Amigos” – Jodie Nakamura, Ryan Mercado and Liam Tobin – the wait time for workers’ comp hearings has been cut in half. This 2017 Team of the Year from the Department of Labor and Industrial Relations launched a project to digitize mountains of paperwork from some 20,000 claims a year. They’re just a sampling of our homegrown talent. We just need to do more to create the supportive environment around them that will launch and sustain their careers here in the islands. I hope you’ll leave today knowing that we have laid important groundwork and that Hawai‘i is on the edge of something exciting. We have always been a state that cares about the elderly. We are making good on that. I am proud that together we were able to pass Kupuna Caregiver legislation that provides assistance for full-time family caregivers who also have full-time jobs. This is a win for Hawaiʻi’s families. We also worked to make sure those who have served our state get to retire with the dignity they were promised and deserve. With the Legislature’s support, we took aggressive steps that will save us $1.6 billion over the next 20 years. As our kūpuna have taught us, paying our bills, honoring our obligations and saving for the future is how we build a brighter future. And we have done that. One value that has guided this administration is to not simply pass on our debts to our kids and grandkids. Together we have made tremendous strides in this task – building our Rainy Day fund to $310 million. We have gone after the tax cheats and collected millions from those who were not paying their fair share. And we are working to modernize our tax collection system to make it easier and fairer for the people of Hawaiʻi. We have made needed changes to improve the system so we can collect the tax revenues we rely on for state services. I believe we’re on the right track to accomplish this major task. 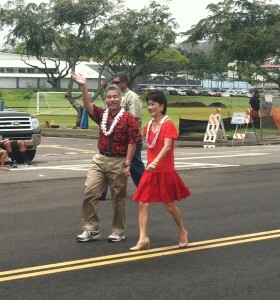 Governor David Ige and wife, Dawn Ige, march in the 52nd Merrie Monarch Festival Royal Parade Saturday morning. Photo credit: Tiffany Epping. At the beginning of my speech, I said Hawaiʻi is a beautiful and complex place. I believe that is our gift to our children and to our future. Imagine a future economy for Hawai‘i that isn’t reliant solely on tourism and the military. Imagine a future where local entrepreneurs are inventing useful products and services that are sold across the globe. Imagine that we use our temperate weather and four growing seasons to develop new high- tech agricultural tools that increase yields for farmers from Hawai‘i to India. Imagine that we farm our nearshore ocean waters, too, feeding our own communities and the growing global demand for seafood. And with these new businesses, there’s new demand for scientists, technicians and marketing professionals. And what does this mean for the people of Hawai‘i? It means a healthier economy with quality jobs that enable us to improve our schools, take care of our kūpuna and provide more affordable housing. This future Hawai‘i isn’t as far off as it seems. We’ve already set things in motion. We’ve put stakes in the ground and we’re making progress. To face the challenges of the future, Hawai‘i must seize opportunities, embrace change and identify the game-changing steps we need to take. Together, the possibilities are limitless. I believe the qualities we treasure most about Hawai‘i are what will draw our children back to us. When I ran for Governor four years ago I wanted to take my lifetime of public service and fundamentally change the path we were taking. I have committed my life to the people of this state. No matter what challenges we face, no matter what frustrations or issues we have with one another, I find my strength and courage in our shared sense of unity. Gov. David Ige has received a list of nominees from the Judicial Selection Commission for the vacancy created by the retirement of former Associate Judge Daniel R. Foley. Foley retired on Dec. 30, 2016. The commission submitted the list of nominees to the governor on Jan. 4 after careful evaluation and investigation into the background and qualifications of each applicant. “I thank the Judicial Selection Commission for its hard work in screening and selecting qualified nominees for the Intermediate Court of Appeals. I have received the names and will be interviewing each nominee in addition to seeking public comment before making my decision,” said Gov. Ige. The public is welcome to submit comments on any of the nominees on the governor’s website at governor.hawaii.gov – Contact the Governor. Gov. 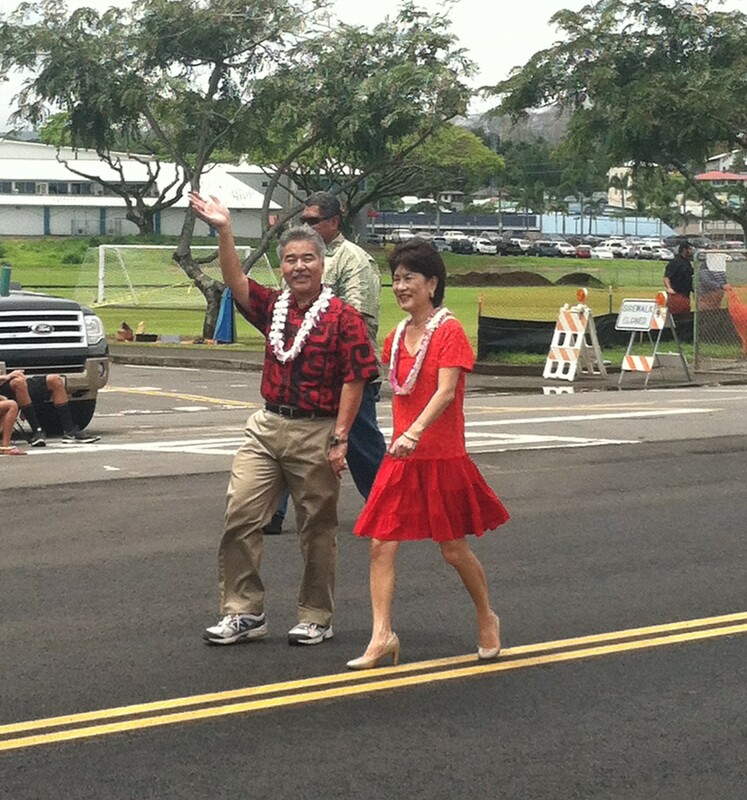 Ige has until Feb. 3 to make his appointment, which is subject to senate confirmation. Gov. David Ige signed an emergency proclamation in the wake of heavy rains and flooding that caused extensive damage throughout the state especially the counties of Maui and Kalawao. The counties are expected to need rehabilitative assistance from the state to respond to the damage caused by the severe, sudden and extraordinary rains. “The severe weather that struck the state this week caused heavy damage, and the state stands ready to support the counties in the recovery effort,” said Gov. Ige. The disaster emergency relief period began on September 13, 2016 and will be in place for 60 days. Governor David Ige will be having a Community Connection meeting tomorrow. He will talk briefly about his Administration’s strategic initiatives and more importantly, to listen and engage in conversations about top-of-mind issues for the people of East Hawai’i. As you enter the main entrance off of West Kawili Street, the flag poles will be straight ahead and the building will be on the left side. The building name is UCB 301 and Room 100 is on the first floor. If you have time in your schedule, we hope you can attend the Governor’s Community Connection meeting. For additional information, please contact the Governor’s East Hawai`i office at 974-6262. Gov. David Ige notified legislative leaders and key lawmakers that nine bills are on the Intent to Veto list. The Hawai‘i State Constitution requires the governor to give notice to the Legislature by today’s deadline. On July 12, any measure that has not been signed or vetoed by Gov. Ige will become law with or without his signature. This measure authorizes the Employees’ Retirement System (ERS) to make direct payments to a divorced spouse of an ERS member or retired ERS member upon order of the court. Rationale: The ERS must modify its information technology systems before direct payments can be made. It will need state resources to do so. The ERS trustfund cannot be used to pay for ITS work. This measure prohibits employers from accessing and/or obtaining employees’ social media accounts and passwords via coercion or other means. Rationale: In reviewing testimony on this measure, it remains unclear if this practice is occuring in workplaces at a level that requires state intervention at this time. Also, the Department of Labor and Industrial Relations (DLIR) was not provided with any additional financial resources to undertake enforcement. DLIR will need both time and resources to establish an enforcement mechanism. This measure authorizes police officers to request towing of motor vehicles if a driver is arrested for driving under the influence (DUI). Rationale: Current enforcement does not allow drivers to operate their vehicles anyway, once they’ve been arrested or cited for DUI. Also, there are other motor vehicle violations where police should be authorized to request towing. We suggest that this bill be expanded to include the other violations for consistency across the state. The intent of this measure is to allow transient accommodations brokers to register as tax collection agents with the state. This would allow companies such as Airbnb to collect and remit general excise and transient accommodations taxes on behalf of the hosts and visitors who use their services. Rationale: We believe there could be unintended consequences of this proposed measure. Vacation rentals fall under the city’s jurisdiction. In order for this bill to work as intended, counties must more actively enforce their own laws on vacation rentals before they claim additional tax revenues. This measure requires the Employees’ Retirement System (ERS) to transfer contributions by retirees and beneficiaries to the Hawai‘i Employer-Union Benefits Trust Fund (EUTF) for health insurance payments. Rationale: While we understand the practical reasons for this bill, the ERS would be required to comply with the Health Insurance Portability and Accountability Act (HIPAA), which protects health insurance information. Additionally, the ERS would need sufficient time and resources to make modifications to information technology sytems to process such payments. The intent of this measure is to clarify the membership and mission of the King Kamehameha Celebration Commission (KKCC). Rationale: Unfortunately, the amendments proposed in this measure create an ambiguity in the law on how the commission will make decisions. The specific number of commission members was deleted from the bill. Consequently, the commission will not be able to determine a quorum for the purpose of conducting business. This measure offers benefits to Hawai‘i Health Systems Corporation employees facing position abolishment, reduction-in-force or workforce restructuring. Rationale: This measure is still undergoing fiscal, legal, and policy review at this time. This measure establishes a full funding policy and budgetary procedures for routine repair and maintenance of state-owned buildings, including judiciary-owned facilities. This measure mandates that the Department of Business, Economic Development and Tourist (DBEDT) develop — and state agencies enter into – inter-agency agreements with the department rather than memoranda of agreements (MOAs) or memoranda of understanding (MOUs). This measure also establishes a state grant program to fund business development for qualified businesses. Rationale: It is not clear from the testimony why state agency inter-departmental agreements are more efficient or effective in directing resource allocation. Senator Mazie K. Hirono, Governor David Ige, Hawaii Director of Health Dr. Virginia Pressler, State Administrator of Emergency Management Vern Miyagi, Healthcare Association of Hawaii emergency responders, and Dr. Elliot Parks, CEO of Hawaii Biotech today called for increased public awareness and additional federal resources to prepare for and fight the Zika virus in Hawaii and across the country. Senator Hirono and Governor Ige also got a firsthand look at Hawaii Biotech’s work to develop a Zika vaccine. Senator Hirono and Governor Ige get a firsthand look at Hawaii Biotech’s work in developing a Zika virus vaccine. “We all have a stake in preventing the Zika virus and other mosquito borne illnesses from taking hold in Hawaii. We must continue our collaboration and coordinated statewide fight against these illnesses, and with much needed support from the federal government, we will work to reduce the risks here in Hawaii and across the country,” said Governor David Ige. “We thank Senator Hirono for highlighting the dangerous potential for a Zika outbreak in Hawaii. The recent fight against Dengue has prepared us for Zika however we must continue our efforts to eliminate the mosquito vector. County, state, and Federal agencies can provide support and guidance, but success can only come as the result of a strong and sustained community effort to eliminate the mosquito vector and its breeding grounds,” said State Administrator of Emergency Management Vern Miyagi. “We strongly support Senator Hirono’s call for the Federal government’s leadership in the battle against the Zika virus. Hawaii Biotech is working diligently to rapidly develop a safe and effective vaccine to protect all of us from this dangerous virus,” said Dr. Elliot Parks, CEO of Hawaii Biotech, Inc.
For nearly three months, Congressional Republicans have failed to respond to the President’s emergency funding request, even though the virus continues to spread from South America. In Hawaii, there are nine confirmed cases of Zika since 2015, which includes a case of an infected infant born with microcephaly, a serious birth defect directly linked to Zika. On Friday, the first U.S. death caused by Zika was reported in Puerto Rico. Senator Hirono is an original cosponsor of federal legislation that would fund the President’s emergency request to provide resources for education and outreach programs, shore up Hawaii health care workers’ response to Zika, increase Hawaii vector control programs, and support the work of companies like Hawaii Biotech, which is racing to develop a Zika vaccine.